Have fun with lighting if you win this giveaway. Control your lights from your phone. Giveaway is open to US residents and ends on 9/8. Good luck. 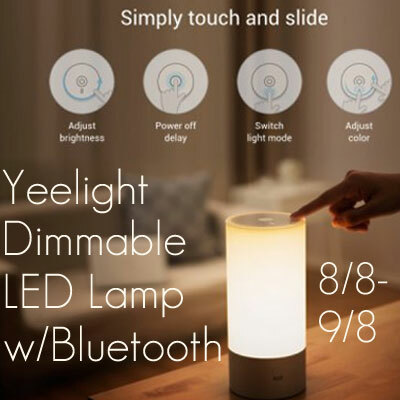 Original Smart Yeelight Bedside Light uses high grade osram led, giving 16 million RGB lights for choices. With simply touch and slide, you can adjust brightness and colors as you want. Moreover, you can use your phone as a Bluetooth remote, design unique lighting scenarios. Giving the romatic and comfortable lighting atmosphere for you. I think the fact that it has a range of 16 million colors is awesome-would find the perfect one I am sure. I love that it can change colors and is dimmable. I love everything about this sleek lamp. Color change, that's it cool to the touch and dimmable. Compact and doesn't take much room. I like that you can change colors! I like that you can adjust the brightness. I like that you can adjust its brightness. The adjustments to brightness and colors makes this light very desirable! I really like that you can use your phone as a Bluetooth remote. I like that you can change the dimness as well as the color... would love to have something like this to help me sleep , yet not be too obnoxious that it would bother my hubby. I like the various colors one can set the lamp one. It looks so soothing. I really like that you can adjust the colors and brightness. Very cool!